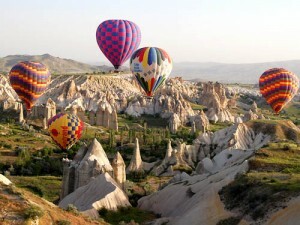 For many years people have been making the trip to Cappadocia to see this natural geological wonder. Initially created by lava eruptions from volcanoes, over time the lava has been gradually eroded by nature to leave the unusual but beautiful landscape that is Cappadocia today. The famous magical “fairy chimneys” have been used as the backdrop for scenes in a number of films. The Turkish name, Cappadocia, is derived through the Greek language, from Persian meaning “the land of beautiful horses”, and has been a UNESCO World Heritage site since 1985. 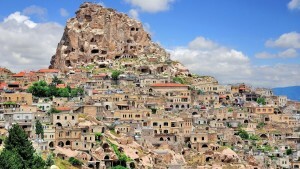 Early records show references to Cappadocia in the 6th century B.C. The name also appears in the Bible in the book of Acts; for many centuries the area was a haven for the earliest Christians. Today, Cappadocia is a popular tourist destination, not only for the spectacular scenery but also for the wealth of cultural features in the area. 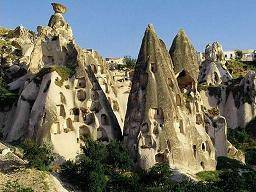 Located to the southwest of the town of Kayseri, the area takes in a number of villages and towns. Many people come to the region for mountain bike activities. You can hire bikes and all the necessary protective equipment in the town. For a more relaxing way to spend your holiday, why not try a typical Turkish bath or “hamam” as it is known. We can now offer you holidays in Cappadocia throughout the year, staying at a family run guest house or one of the traditional cave hotels, so that you can see this unique area of Turkey. Included in the package price we send you will be 3 full day tours and an evening excursion, but there are also a number of other optional excursions for you to enjoy during your stay in Cappadocia.